For a number of reasons more and more people are turning to a gluten free diet. 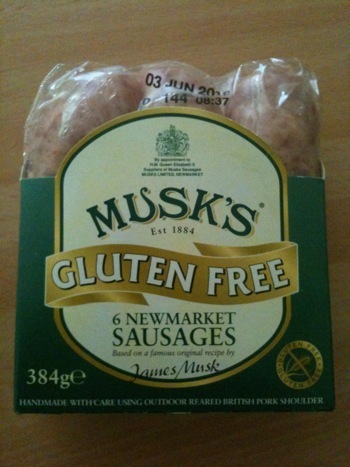 As you may know, sausages can often contain gluten via fillers or binders such as rusk or bread. 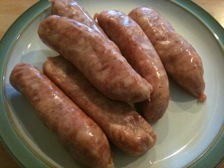 Traditional Musk’s sausages, made using a recipe which goes back over 100 years, contain fresh bread. This gluten free alternative uses rice as a filler rather than bread. Other gluten free sausages have not lived up to expectations. They have produced a sausage which is true to their traditional recipe and yet takes into account changing dietry needs. The blend of spices is absolutely perfect so the sausage is balanced with a slight peppery feel to it. I tried a sausage on it’s own first and aside from the rice it would be hard to tell it from it’s traditional sibling. The sausage is still fairly chunky inside which, for me, is so evocative of so many happy sausage memories. While I appreciate the irony of a sausage sandwich with gluten free sausages I would say that this sausage would suit the whole of the family whatever the occasion. These meaty gems are available from a variety of supermarkets and also directly from Musks.